My Jabong haul | Are online store sales worth it? Jabong is one of my favorite website from where I want to shop again and again. You can see my affection with this website HERE and HERE I have been purchasing from here time to time, but recently I got some lovely brands kurtas with 50% off during the sale. Jabong.com, which is probably the best online fashion megastore in India. it doesn't need an introduction so let me come to the point. Today I'm with my mini haul from Jabong.com. I purchased these kurtas from one of their attractive deals in which they had offered "Buy one get two free". In that, you could buy any three items at the cost of one. ( the price of the highest priced item, of course). I shopped two Anarkali kurtas and one straight cut kurta. I fell in love with the green Embellished kurta just after seeing it on the website. It's lovely green with gold touch. The design and cuts are beautiful. 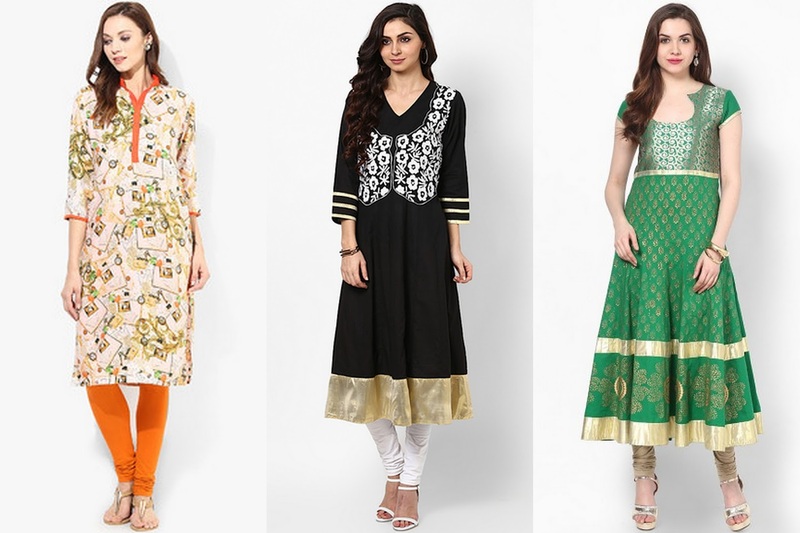 The next item was a black embroidered Anarkali kurta with white embroidery and golden border. The last item I bought was a multi-colored printed kurti that is so cute. I love the color and the touch of orange in this kurti. The total amount was about INR 6500 but I had to pay just INR 3000 and something. Don't you think the deal was wonderful? Online shopping stores offer us a number of deals but the trick is to find the best deal for the best of things and at an ideal time. For example, I was looking for some new kurtas in Pantaloons & Biba the other day but was unable to find anything that would suit my taste. And that I when I logged in to Jabong.com and found this deal. It was a great experience and I highly recommend you all to take full advantage of these exciting offers in the best way possible! I really love all three of these! Perhaps with the original price, one can find them expensive but taking advantage of the fabulous offer, I have no regrets at all!